Cambridge Audio 700 Series review | What Hi-Fi? 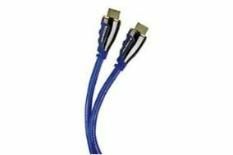 Cambridge Audio is a manufacturer you probably associate more with hi-fi separates than HDMI cables, but the British company has recently added some new cables to its product line-up. The 700 Series sports an eye-catching purple polythene jacket and shiny, solid connectors. As far as picture quality is concerned, the cable allows for a reasonable amount of detail, and edge definition is decent enough for the money. However, this can be bettered by price-comparable alternatives such as Chord Company's SuperShield. Sonically, the cable sounds subdued and far too laid back. The narrator's dialogue during the opening chapter of the Blu-ray of Moon doesn't have any real impact and neither does the accompanying soundtrack. Rivals at this price can provide greater dynamic clout.